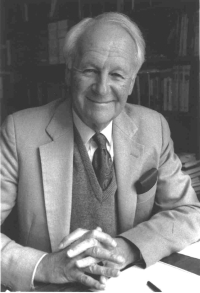 Through his writings and lectures, John Stott (April 27, 1921 - July 27, 2011) helped me grapple with the biblical text and the life of faith. Whenever I opened one of his books, I knew I would be getting an honest and fair treatment of whatever subject he was addressing. I had been impressed with his printed works, but then I heard a lecture he presented to The Veritas Forum gathering at Harvard University (download the audio: "Is Jesus Christ Truth for the 21st Century?"). I was struck by his gracious tone and comprehensive understanding. He was especially good during the Q&A. Students asked their questions and he responded with the patient wisdom that only comes from a long life of faithful devotion. The Protestant Church across the world is better for having had John Stott as one its members and leaders. He will be missed.